DTE: How did you become involved in the participatory mapping network? Kasmita Widodo: Jaringan Kerja Pemetaan Partisipatif (JKPP, the Network for Participatory Mapping) was set up in 1996. In 1998 I started learning about participatory mapping and then went on to study GIS (Global Information System). At the time, GIS was a technology which, we hoped, would do a lot to enhance the benefits of participatory mapping. At that time, studying GIS was a luxury because not all NGOs had the ability to do that. At that time, I was working to build up information at village level. There was something called the Village Information Centre (Pusat Informasi Kampung – PIK) and participatory maps were an important part of that. Women were involved in the Participatory Mapping Network from the early days and one of the initiators of the network was a woman: Alex Flavell from Canada. She did participatory mapping in Central Sulawesi and West Kalimantan. 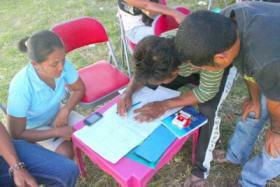 DTE: How do people in the village respond when they are introduced to participatory mapping? KW: Participatory mapping is not usually the first interaction between support NGOs and the community. Usually there has been some organizing in the village around local issues related to land, natural resources etc. So mapping becomes a next step to respond to the problems there. Mapping is a tool to clarify a community’s rights to land, where there are problems over tenure, or claims from an external party, such as a company with a licence to use the land. Mapping also has the aim of showing the connections between the community and the land, the history of the community’s life in their territory, indicating the locations of historical sites and so on. The participatory mapping process opens up community thinking about the management of their territory. DTE: How far is gender taken into account in the community mapping process? Are women included in the mapping facilitation team? Do communities involve women in the mapping process, to ensure they get women's perspectives as well as men's? KW: As I’ve already explained, mapping isn’t the only process when organizing to respond to community problems in the village, so the involvement of women depends a lot on what has gone before. If, in that village women are taking the lead, they will be involved. Like in Molo-NTT, where Mama Aleta is from, women are very actively and strategically involved there. In fact that whole story was initiated by a movement of women who rejected mining. So, when my friends in JKPP and I are asked to facilitate participatory mapping there, Mama Aleta and women in every village they organise, play a dominant and strategic role in preparing for mapping. So, if women are involved from the start and the role of women is strengthened through the actions that have gone before, the role of women will automatically be strengthened in the participatory mapping process. But in participatory mapping, we are always reminded that what we call the relationship, the connection between people and the land, for the villagers this means we’re talking about men and women, and they each have their own particular connections. For example, with the Baduy and Dayaks, when they nugal or begin the planting of dry rice, women sow the rice seeds while men make the holes for sowing the seeds. I see that this is a strategic role for women. There is bound to be a long history as to why it is the women who sow the seeds. This has to be ‘mainstreamed’, or fully taken on board by my facilitator friends, so that when we do the mapping, it means we are representing this relationship: the relationship between the community and their territory. The information must cover men, women and children. When the organizing which precedes the mapping doesn’t involve women sufficiently, then the mapping process still has to involve women, because we still need to represent their relationships with land and natural resources on the map. The process of involving women becomes affirmative. This is what we just did in West Kalimantan, where I set the number of participants and ensured that at least one woman representative from each village had to be involved. KW: In my experience, in the mapping process, women will point out information related to cultivation, as in the Dayak territory. When planning how to use the maps, women think about the future of their territory from their own perspectives, as I have seen several times from holding focus group discussions, where the results of their discussions are very gender-specific. They will come up with issues related to the availability of water at home, and health facilities which need to be improved because there are complaints when they are sick or are going to give birth, that the facilities are too far from the village. These things come out of planning for the future of their territory. I don’t think that those things would come out if there were not special discussions for women, and they were in discussions dominated by men. DTE: can you give an example where this has worked well with a good result? KW: In Molo, East Nusa Tenggara province, the mapping process is actually still going on, but the role of women is very evident, especially in Mama Aleta’s group, when planning the management of their territory. In Pagu, North Halmahera, Ibu [‘Mrs’] Ida (The Pagu community’s customary head) has told us about the problems of the Pagu indigenous territory. She is also the one who has asked us to map their territory, which has long been controlled by a gold mining company. During the mapping process, Ibu Ida joined the field surveying in the forest for many days, to point out the boundaries of the community’s customary territory. DTE: What are the main obstacles to women taking the lead? KW: There aren’t any. Men want to learn about mapping, and want to show us their territories too, so they get involved in the mapping process. Where land is concerned, in several places in Indonesia, it is actually the women who hold the rights. In the Tanah Ai indigenous community, in Flores, East Nusa Tenggara, in discussions about making the map and how the map would be used and about the land rights, it was clear that women are the right-holders, including in matters of administration like paying land tax, which is done in women’s names. Clearly, in their customary system, women are the land rights-holders. There, women are excellent sources of information about their customary territories. In many other areas of Indonesia, men are much more dominant than women. On top of that, their customary systems don’t involve women very much in decision-making about land, so that as facilitators, sometimes we have to use “coercion”. This “coercion” is important and needs to be done sometimes. It includes holding women’s focus group discussions. But we have to have an understanding of the community’s systems, because there are issues that are just not possible to talk about together. Another strategy, if men are clearly dominating the discussions, is to have a women’s facilitation team which goes from house to house or joins discussion groups involving women. Here, the women facilitators can explore issues that are considered important to women. The map doesn’t just contain spatial information but also social information. It is sometimes this social information that we get mostly from women. So as facilitators, we have to be able to document and encapsulate aspects that are related to women’s connections to land, water, social issues and community institutions. DTE: In your many years of community mapping experience, have you seen any changes in the gender dynamics in the communities you work with? KW: I see that there’s an increasing awareness of gender dynamics in the communities, with the emergence of leaders of women’s movements at the grassroots level who are voicing their rights to land and natural resources. I understand that this doesn’t happen because of a stand-alone process of organizing and support, but arises from the interaction between communities and various actors who are prioritising the role and rights of women in the long term. In terms of organizing mapping, when setting the time for meetings, we can make arrangements which make it possible for women to attend, and still be able to do their work in the village, for example by paying attention to the seasonal calendar. Women have a close connection with the land and natural resources, so there are going to be times when they will be hard pushed to find any time, for example, during the harvest or at the start of cultivation. So we need to be flexible when we set up meetings. The situation at village level, it has to be admitted, is that men remain too dominant, so first we need affirmative action for women. Second, we need strong organizing in which in-depth discussions are done with groups of women. We need to convince women that it’s important for them to attend meetings. Third, we need to choose times that suit women. DTE: Talking about JKPP’s work at national level (work on the One Map Policy with government agencies and other partners) to what extent is gender justice accounted for in this forum? Can you give details? KW: Work started on this One Map in 2013, though it has been talked about since 2012. It is related to the integration of all spatial information in the ministries and agencies which are involved in the governance of one location, using the same references. What hasn’t yet been accommodated are the maps of the villages, the participatory maps. So that the maps of indigenous territories with all their social information can’t be an official reference for the government. From the start, One Map aimed to integrate the official government maps, but JKPP, AMAN and several other organizations wanted to push the participatory maps as being important to integrate too because they were linked to land rights. At the moment BIG (the Geospatial Information Agency) has created an application, which lets communities contribute information from community maps. But there are still some differences of opinion between BIG and JKPP regarding the concept of participatory mapping. According to BIG’s concept, participatory mapping is when a community, which has spatial data, coordinates, names of places, rivers etc, provides this information to BIG. The data will then be examined as to its accuracy, standard etc at a later stage. If everything is correct, the information can enrich the topographical data held by BIG. This is very different from JKPP’s concept of participatory mapping, because we are talking about village people’s rights of tenure or use which are juxtaposed with maps showing licences issued to businesses such as industrial timber estates (HTI), oil palm, forestry or other thematic maps. We have conveyed this to them and so JKPP has been asked to draft a Standard Operational Procedure for participatory mapping. For JKPP, participatory mapping means fully representing an indigenous territory, its borders and land use, because this is a thematic map, not a base map. If this participatory map can be integrated, we can compare it with other thematic maps such as those showing mining, forests and plantations. Even though in this case BIG does not have the authority to recognize indigenous territories, the agency ought to be able to accommodate this spatial data. In terms of gender justice and the One Map, this is still a long way from what’s being discussed by government agencies dealing with this policy. Thus far, these participatory maps can’t be included or referenced when the government exercises its control or management of land, indigenous territories, forests and so on, meaning that conflicts arise with communities. We hope that the One Map will make the maps of customary territories, or these participatory maps visible, so they can be referenced when planning to issue licences or when establishment of the status of the forest zone (Kawasan Hutan) is carried out. DTE: What is your greatest success story in this participatory mapping work? KW: I can’t claim it as my own or my organisation’s success, because participatory mapping isn’t the only effort to defend the rights of communities. Around 2005-2006, in post-tsunami Aceh, together with Rumpun Bambu Indonesia Foundation (YRBI) we facilitated many gampong in Aceh to do mapping and gampong-level planning during Aceh’s rehabilitation and reconstruction period. There were several gampong under the leadership of their keuchik (gampong leaders) which made full use of the maps to plan the development of their gampong, post-tsunami. They used the map consistently, to decide where houses could be built, where the water sources were and so on, and all this was decided collectively. I saw there how important it was to build collective agreement. The relationship between these gampong communities with YRBI and JKPP continued post-mapping, to monitor the progress of the rehabilitation and reconstruction process.The result is that every planning measure coming into this gampong, has to refer to the collectively agreed participatory map. From this story I want to emphasize that unless the mapping is done with a collective agreement that all members of the community will stick to, then the participative map won’t be any use. In Ujung Kulon, Banten province, western Java, there was a conflict between the community and the Ujung Kulon National Park. There was one small village inside the national park area, but they had a history of living there and had negotiated for a long time for their community to still be able to remain there. We helped to prepare village maps and showed that community’s efforts to protect part of the national park and helped the negotiation process with the government. At that time it was clear that community was not very well prepared to face the uniformed officials involved (police, military, and national park staff). The NGOs involved in this case helped the community during that time, accompanied them and defended them in these negotiation forums. So, the lesson from this is that after the mapping has been done, it is important to continue supporting the community. Because if you don’t, when the community comes to discuss their map with external actors, they are not necessarily ready for that. So, at the beginning of the mapping process there needs to be a strong organizing process to ensure the representation of women in the mapping process. After mapping, it is just as important to support the community (men and women) to use the map, especially the legal and policy consequences of using the map as a tool to demonstrate community rights.